Mondays – Thursdays | 4:00 p.m. to 8:00 p.m. 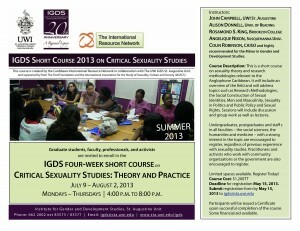 Course Description: This is a short course on sexuality theory and research methodologies relevant to the Anglophone Caribbean. It will include an overview of the field and will address topics such as Research Methodologies, the Social Construction of Sexual Identities, Men and Masculinity, Sexuality in Politics and Public Policy and Sexual Rights. Sessions will include discussion and group work as well as lectures. Undergraduates, postgraduates and staff s in all faculties – the social sciences, the humanities and medicine – with a strong interest in the topic are encouraged to register, regardless of previous experience with sexuality studies. Practitioners and activists who work with community organizations or the government are also encouraged to register. Course Cost: $1,200TT | Deadline for registration May 15, 2013. Participants will be issued a Certificate upon successful completion of the course. This entry was posted in Announcements on May 13, 2013 by Kelly Baker Josephs.